Floor press, the primitive version of the bench press, is a core-attacking and strength-building upper-body exercise that lets you lift weights without excessive shoulder stress. 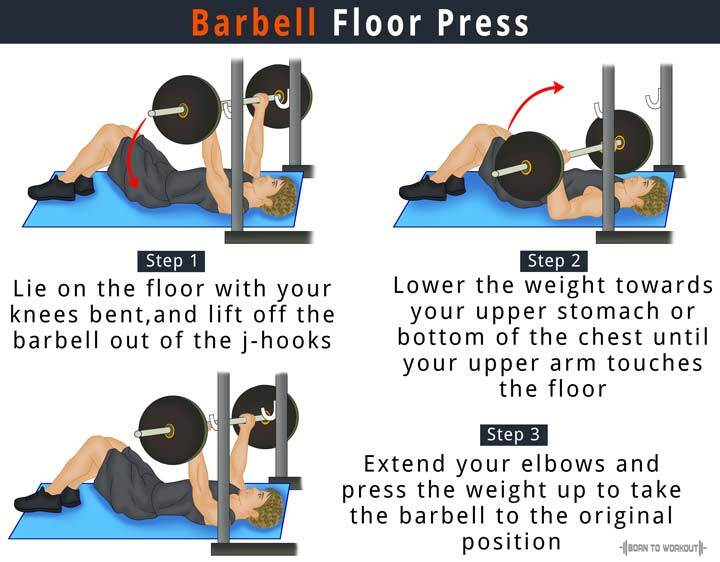 It works best for those who want to feel the effect of bench press on their triceps and reduce the risks of shoulder injuries while training. Unfortunately, with the growing popularity of bench press, powerlifters have now become less interested in training for the floor press exercise. However, if you are training for building massive arms as well as increasing the strength of your chest and shoulders, the floor press should be added to your workout repertoire. Performing the floor press involves powerful extension of your elbows and overloading your triceps with weights, which helps in developing huge arms while reducing undue joint stress. It negates lower body drive and focuses all the stress on the upper body for gaining strength. Moreover, lower back pain associated with regular bench presses is not experienced since the floor press reduces lumbar extension. Rack the barbell on the j-hooks placed at an appropriate height. Lie on the floor with your knees bent, and position your head so that your eyes are lined up under the bar. Pulling your shoulder blades together, lift off the bar out of the j-hooks. Lower the weight towards your upper stomach or bottom of the chest. For powerful pressing, make sure that your elbows are tucked at 45° throughout the movement. When lowering the barbell, pause for a moment once your upper arm touches the floor. Explosively extend your elbows and press the weight up, keeping your elbows, wrists, and the barbell in line while you finish taking the bar exactly to the starting position. 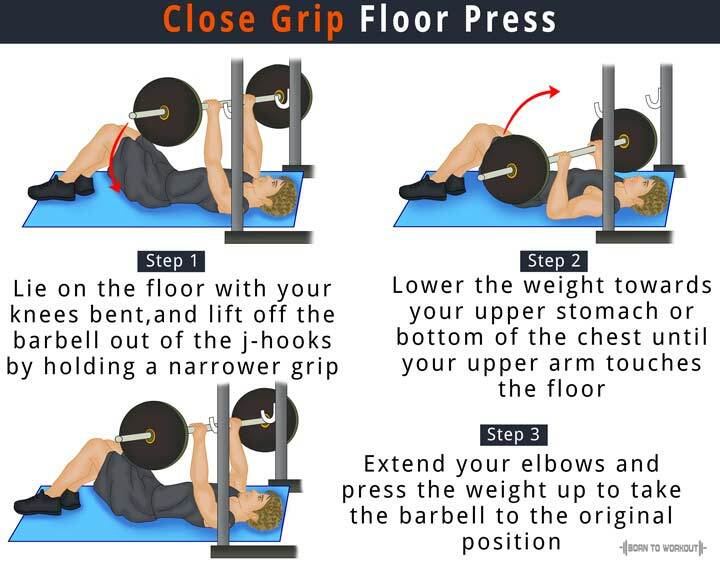 The close grip variety is done in the same way as the conventional form, but the barbell is held with a narrower grip as compared to the shoulder-width grip of the normal floor press. When at the top of your movement, make sure that you squeeze your working muscles. Do not forget to exhale while pushing the barbell back to the starting position.